On July 1, 1983, California State Law was changed to require the reassessment of property as of the first day of the month following an ownership change or the completion of new construction. In most cases, this reassessment results in one or possibly two Secured Supplemental tax bills being sent to the property owner in addition to the annual Secured property tax bill. The Assessor first determines the new value of the property based on current market values. The Assessor then calculates the difference between the new value (set at the time of purchase or completion of new construction) and the old value (set on January 1 of the previous fiscal year). The result is the supplemental assessed value. Once the new assessed value of your property has been determined, the Assessor will send you a notification. This is the date that the supplemental value notice was mailed to the taxpayer. The taxpayer has 60 days from the date of the notice to appeal the value. This is the date the tax bill was created. Here you should see the street address of the piece of property being taxed by your tax bill. 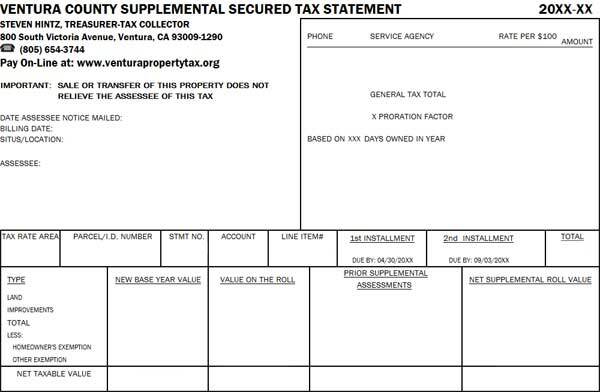 If you do not own property at the address listed here contact the Treasurer-Tax Collector’s Office at (805) 654-3744 to acquire the correct tax bill for your property, and contact the Ventura County Assessor’s Office at (805) 654-2181 to correct the Master Property Record. Unimproved property will not have a situs address. This is the decimal percentage rate that the taxes are based on. The Tax Rate Area in which the property is located. Special districts, such as schools, cities, and water districts are collecting money for voter approved bonds and special assessments. Because not all of the bond rates are the same, you pay taxes according to which bonds were approved in the area where the property is located. Governed by the Revenue and Taxation Code for the State of California, the amount calculated on this line is equal to 1% of the Net Total of the assessed net value of your property. For questions regarding Proposition 13 contact the Ventura County Assessor’s office at (805) 654-2181. The items listed here are approved by the voting public prior to appearing on your tax bill. For information regarding any of your bonds, contact the taxing district at the telephone number provided next to the bond name on your tax bill. The Ventura County Treasurer-Tax Collector has no jurisdiction regarding the bonds listed on your bill. This is the Total amount of tax you will be paying for the fiscal year. The amount due here is equal to the total amount calculated for Proposition 13 tax and all voter approved bonds. The date on which supplemental tax bills become delinquent varies depending upon when they are created by the Auditor. If the bill is created between July 1 and October 30, the taxes become delinquent at the end of the business day on December 10 for the first installment and at the end of the business day on April 10 for the second installment. If the bill is created between November 1 and June 30, the delinquency dates, which are printed on the bill are determined as follows: The first installment is delinquent at the end of the business day on the last day of the month following the month the bill was mailed; the second installment is delinquent at the end of the business day on the last day of the fourth month after the first installment delinquency date. Penalties of 10% are added to any installment, which is not paid on time, and an additional $30 charge is added to a late second installment. This value is the purchase price or fair market value, whichever is greater. This was the taxable value on the secured tax roll for the fiscal year in question. This is a change in assessed value that took place prior to this change. This is the value that this supplemental tax bill is based on.